Traditionally, vehicle transportation includes dropping off the vehicles at the depot, where they are being loaded and delivered to another terminal for owners to pick up. But there are companies like Phoenix Car Transport which offer Door-to-door Car Transport. When booking a car shipping service, it is important to plan your time for pickup and delivery. Also, in other situation, the location of both is important too. But not while doing Door-to-Door Car Transport! Phoenix Car Transport promises to pick up your vehicle at your door and delivers it safely to the door of another location. We understand the inconvenience of driving around in the city and, of course, we understand the value of the time you spend on it. Trust our services and leave all the work us to do. If you are looking to have your car delivered right to your front door, you should discuss your needs with us. 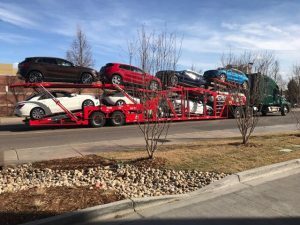 Often, Phoenix Car Transport organizes a small flatbed auto transport carrier or even a tow truck to bring your car right to your home. It is very common for people to move across the country, often because of work relocation. Your car is something that will usually move along with you. Door-to-door Auto Transport services will prevent you from the stress of driving your car thousands of miles since we will pick up your car and deliver it anywhere nationwide with our safe and affordable auto transport carriers. Save considerable time by eliminating vehicle drop off and pick up. We take care of all that for you! No matter what the reason is for moving your car, Phoenix Car Transport will safely deliver your car to your door. There is such ease in utilizing this service. For more information, you can look at our FAQ’s page or you can contact us by calling (623) 500-6143. You can now request an instant quote on your smartphone by visiting our website in the mobile versions, which is available for both iPhone and Android.